Kashflow enables you not only to create Quotes, but also email them to their respective Customers. 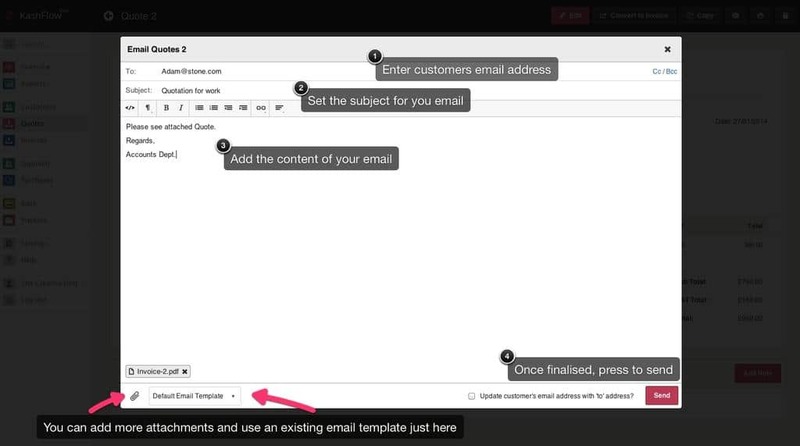 You will now be given a pop-up screen to set the parameters for the email. 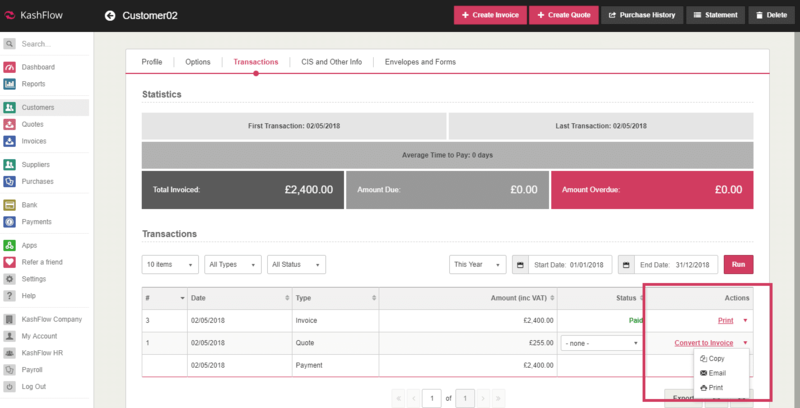 The “To” Field will be automatically populated with the email address specified within the Contact Details for that Customer; however, if they do not have one or you wish to use another you can simply type directly into the field yourself. At the bottom you can choose to attach further documentation, and to save some time you can specify what Email Template you will use on this occasion, if you have previously created one. Email Address – The e-mail address is automatically filled based on the e-mail address contained in the customer profile. This can be easily replaced by typing in the box. The CC allows you to copy another recipient in to the email. BCC allows you to BCC another recipient on the email, the other recipients won’t be able to see this persons email. The message is the e-mail content that your customer will see. You can also use automatic text substations in the e-mail that your customer will see. Click the Text Substitutions link for more details. To attach additional files to do this e-mail, click the additional attachments link. This will create a Note for the Quote detailing when it was sent, and to whom.